One of the most common reasons people seek an eye consult is the sudden onset of floaters or flashes of light. In actual fact, this series of symptoms are natural phenomena which will affect most if not all people at some point in their life. Most of our eyeball is filled with a jelly like substance called the vitreous, and this is a solid blob at the time we are born. It is made of a number of molecules including hyaluronic acid (the substance that lubricates our joints) interspersed in a collagen matrix. With age, these molecules separate out from the collagen, leading to the formation of liquid filled cavities within the vitreous. 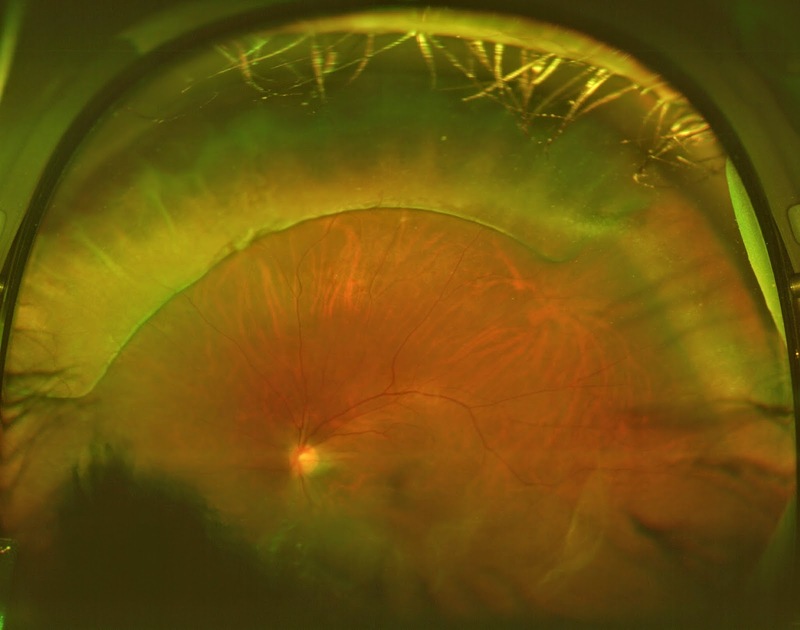 Usually, a thin layer of the vitreous gel continues to line the retina of the eyeball for many years, even though the centre has turned into liquid. For some people at this stage, floaters are noted already. These are generally perceived as 'transparent', and look like little bubbles/circles that may be arranged in string like patterns. I've even sometimes had children of 9 or 10 years old tell me that they see these things. As a person gets older, even more of the jelly in the center liquefies. At some point, the remaining solid vitreous lining the retina at the sides collapses inwards towards the fluid filled center-this is called a 'posterior vitreous detachment' or PVD. When this happens, there is a dramatic change in the floaters. Instead of transparent bubbles in clumps or a string, more obvious gray or black floaters like a cobweb or mosquito can appear. Sometimes these are associated with flashing streaks of light at the side especially in the dark, when turning the head. That's why the term 'floaters and flashes' came about. As the layer of vitreous jelly peels away from the retina, nothing happens most of the time. However, if that layer happens to be stuck firmly at some point to the retina, this area of retina can get torn as the jelly peels away. Imagine peeling the skin of an onion. If the layers are not stuck together, they can come off nicely layer by layer. However, if the layers are stuck together, peeling one layer off will tear the underlying layer. In the pictures above you can see a retinal hole before and after it is lasered. The white blob floating to the right of the arrow is the piece of retina that has been torn off. In the bottom picture, there is a white circle around the hole. 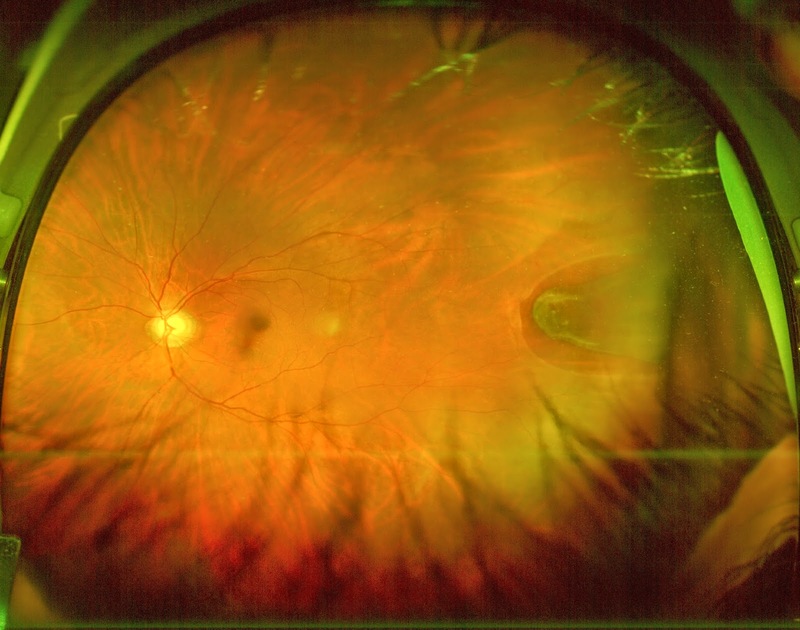 This is retina that has been treated with laser, which causes the retina to stick to the wall of the eye. 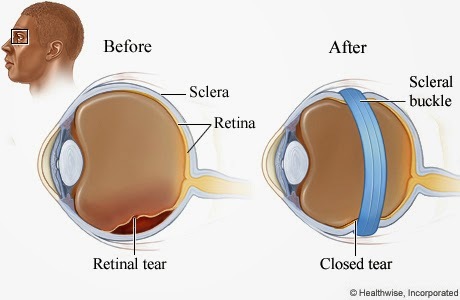 Even though the hole is still there and cannot be closed, the retina is now much less likely to detach. The picture above shows a large U shaped tear on the right but no retinal detachment yet, while the picture below shows 2 retinal breaks (one oval hole and one curvy tear on the right) with most of the retina already detached (greyish areas). How do we treat these problems? As with all the things we deal with, some things we can treat well, and other things-well, are still looking for a solution. Unfortunately for many people, the annoying floaters continue to be a problem for many months or even years, although they do generally get less obvious with time as they drift out to the periphery somewhere. They are more obvious in bright situations, so I tell my patients to wear sunglasses when they go outdoors and perhaps to dim their computer screens. But there is no medication to clear them. Some surgeons do 'floaterectomy' operations, but these are generally frowned upon by most eye doctors because manipulating the vitreous gel confers a risk in itself of retinal tears and retinal detachment. Plus a risk of early onset cataracts associated with removing the vitreous gel. Wherever a retinal break (hole or tear) is seen and the retina is not yet detached, laser treatment is done. This takes 5-10 minutes, and the chance of future problems is very significantly reduced. 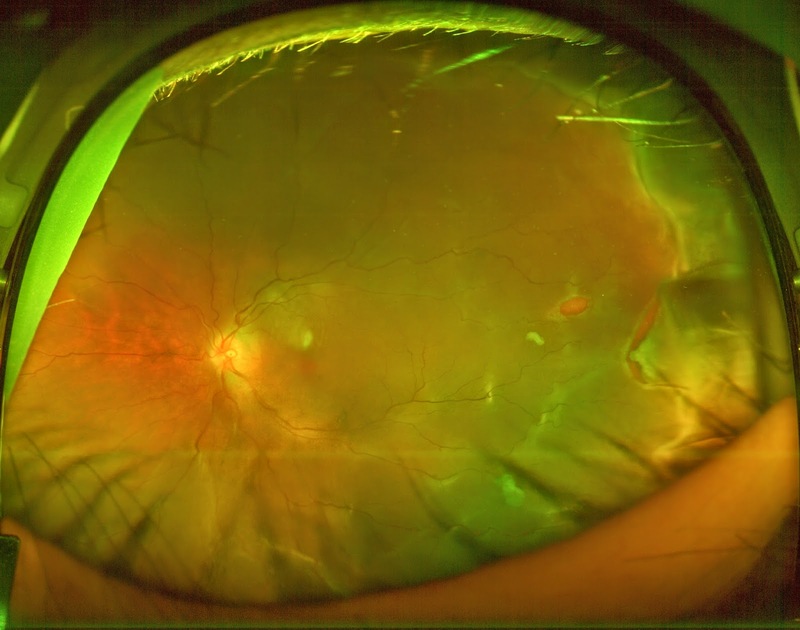 Unfortunately by the time some patients arrive at the doctor's office, the retina is already detached, by which stage it is too late to solve the problem with laser treatment alone. There are basically 2 ways to repair detached retinas. The first involves stitching and fixing a band of plastic around the circumference of the eye like a belt. This presses the wall of the eye inwards, and by doing so brings it closer to the detached retina. It also reduces the pull of the vitreous on the retinal tear. This can be combined with drainage of the fluid under the detached retina, and also freezing or laser treatment to form a permanent seal around the laser tear. In the picture below, the ridge at the top part of the picture is the view from inside the eye of the band pressing inwards. The second method involves removing the vitreous gel (vitrectomy) and then replacing the gel with a gas or silicone oil. This second method can actually also be combined with the first in complicated cases. There are pros and cons with each type of surgery, which perhaps should be addressed in a later post. Suffice to say that wherever possible, most surgeons in Singapore prefer to do the first method (Scleral buckling) as it is an external procedure, with no requirement to posture face down (as the patient would have to do if it was vitrectomy with gas) and no need for a second operation to remove silicone oil (as is sometimes done with vitrectomy and silicone oil). Oh good, I'm not the only one who has experienced this! Well, I don't think it was exactly what you are describing here, but I have had experiences where those little flashes of white are almost all I can see! If I am thinking on my experiences, I seem to get them when doing some kind of strenuous exercise and begin to go light-headed. Does that sound like a cause for this? It is people like you that really make a difference in the lives of people with eye floaters. I suffered for 12 years from eye floaters and nothing I tried worked. Fortunately, I found out about a natural way that finally got rid of my eye floaters for good.